Despite what the corporate managers who run the Australian Football League and programmes like "The Footy Show" would have most supporters think, Australian Rules football and politics do go together and have always done so. Football has never existed in a vacuum from the rest of society and footballers have often being willing to fight for their rights. The following snippets, supplied by "The Footy Philosopher" and his "Apprentice", aptly illustrate this point. ▫ The first recorded strike in football occurred in 1883 when two Carlton players were suspended by the Carlton committee for misbehaving on a trip to Maryborough. In response, nine players refused to play any further games and the team's fortunes slipped. ▫ On July 29, 1911 several St Kilda players went out on strike in protest at the club committee's banning of a former player and a present player's father from the change rooms prior to the match. The inner club wrangling saw Carlton win the following week's match by 20 goals. ▫ During the First World War there was much debate about whether or not football should continue to be played when there was a war on. There were many editorials and letters in the Melbourne papers about the issue. Some wrote that it was unpatriotic to play and that the young men doing so ought to be fighting in Europe. Others wrote that if the working class was to sacrifice football, then the ruling class should sacrifice horse racing; a proposal that was greeted with hostility by the Victoria Racing Club. Some clubs, notably Melbourne, voluntarily withdrew from the competition for the duration of the war and many others followed or were pressured to do so. By the 1915 season, only four clubs remained- Carlton, Collingwood, Fitzroy and Richmond; all of whom were known for strong working class followings. By way of compromise, the VFL agreed to allow Army recruiting officers to address the crowd at half time and exhort footy fans to enlist. This practice was soon discontinued when the recruiting officers were repeatedly driven from the ground under a hail of missiles. The crowd threw whatever came to hand and made it clear in no uncertain terms where they stood on the Patriotism vs. Footy issue. ▫ During a strike in June 1920, Geelong player, Basil Collins, made the mistake of accepting work whilst the strikers were still out. Geelong Trades Hall announced it would boycott the club "if the scab, Collins, is selected again." Collins solved the problem by standing down, but was allowed to play again after the strike was over. Three weeks later at Collingwood a Magpie player with strong Union affiliations broke the unfortunate Collins' jaw. ▫ For three decades after the 1928 waterfront strike, policemen were barred from playing with the VFA club Port Melbourne as a result of a wharf labourer having been shot and killed during a row over scab labour. It was not until the late 1950s that the committee rescinded the rule after two players decided to join the Victoria Police. ▫ The aftermath of the waterfront strike caused further waves in football on September 8 1931 when a game between West Adelaide and Port Adelaide was boycotted by a number of Port's players. The boycott stemmed from West Adelaide's selection of a cop named McInerny who was known to have been involved in protecting scabs and breaking pickets. 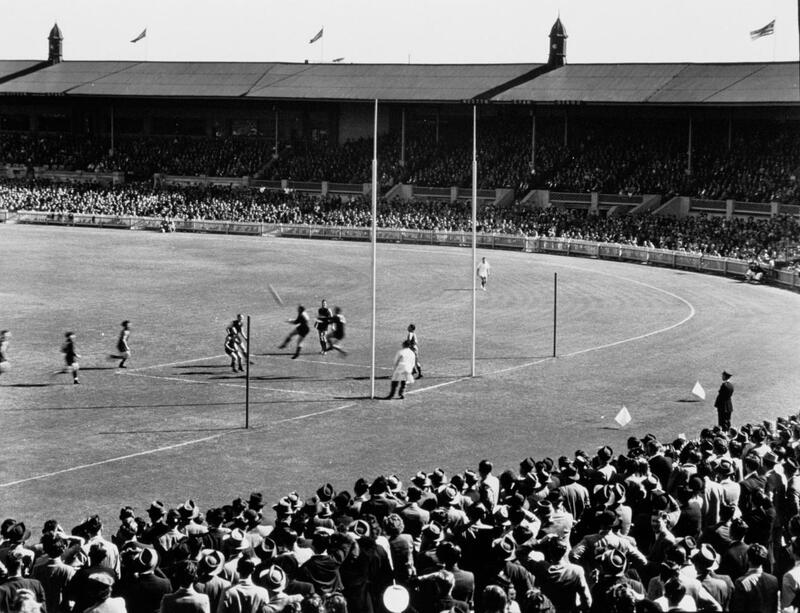 The game went ahead as planned, but as the majority of Port Adelaide players and supporters were drawn from the ranks of local unionists the heckling and abuse was intense. At one point a ball that was kicked into the crowd came back sliced in two. ▫ Prior to the late 1960s and early 1970s the Australian cities and countryside were run along apartheid lines with aborigines largely confined to reserves or kept out on the fringes of town. Since the 1967 referendum aborigines have been allowed to walk the streets, but many country towns maintain racial separation by relegating blacks to second class services and separate pubs. Whilst these unofficial rules have long been unable to keep aborigines out of football the racial divisions have been echoed in the fact that many areas boast separate teams for whites and blacks. These teams and football in general have given aborigines an opportunity to prove themselves the equal or better of their white opponents and the quality of black players has gradually seen many white teams cynically integrate. In towns such as Carnarvon (in the far north of W.A.) Aborigines in the 1970s also used the football field as an opportunity to get some pay back against those struggling to keep them down. Unpopular and racist police, teachers and store keepers were attacked on field as any punishment for the attacks would side step the usual legal authorities and wind up instead in the league tribunals. ▫ Early in 1970, Collingwood stars Len Thompson and Des Tuddenham announced that they would not be playing unless their club agreed to more generous terms of remuneration. Only weeks after a settlement was announced, five Essendon players, led by full back Geoff Pryer and captain Don McKenzie, also went on strike until payments increased. Essendon left the five out of the first game of the season and lost by eight goals! As a result of these incidents, the VFL introduced a new payment scheme, with a sliding scale based on length of service. ▫ Just prior to the 19th VFL round in 1981 32 League umpires resigned in disgust at their treatment by VFL authorities. Come the Saturday Reserve Grade umpires were brought in resulting in even worse decisions than usual. A week later the dispute was settled and the umpiring vaguely improved. ▫ A few weeks after the umpires' dispute South Melbourne players struck over pay and conditions. The coming move to Sydney also had supporters and players up in arms with both demanding a say in the club's future. The strike lasted almost eight weeks and ended with the club committee and the appointed coach resigning. ▫ In the mid 1990s strikes over injury compensation and the right of players to a decent slice of the emerging AFL pie were only averted when club bosses granted players a number of their demands. Since that time there have been further rumblings in the change rooms. ▫ In 1998 West Coast Eagle's coach Mick Malthouse shot holes in his reputation as a corporate player when he came out publicly in support of West Australia's forests and against clear felling. Having met up with representatives from the environmental movement and timber industry he decided to take a visit out to the forest himself. Appalled by what he saw Malthouse then threw his weight behind the green camp and openly supported blockade actions that summer. Despite the media dropping bucket loads on him Malthouse convinced other sports people to join him in his stand. In no time flat ex Eagle Craig Turley and basketballer Luke Longley could be found atop trees and blocking logging work. Ex-Olympian Shirley Strickland was also brought in and had her car fire bombed as a result.